The Shaw Festival is currently presenting the world premiere of Michel Marc Bouchard’s latest play, The Divine: A Play for Sarah Bernhardt. The play will run in its original French as La Divine Illusion: Une pièce pour Sarah Bernhardt at the Théâtre du Nouveau Monde in Montreal in November this year. Just as in Christina, The Girl-King at Stratford last year, Bouchard has taken historical events and turned them into fantasy, although he at least stays closer to the basic facts in The Divine, than he did in Christina. As with his other plays, like Tom at the Farm earlier this year in Toronto, The Divine is marred with improbabilities and illogical plot developments. It seems like two separate plays – one about a poor seminarian and his family, and one about Sarah Bernhardt – that have been artificially shunted together with neither half illuminating the other. Sarah Bernhardt (1844-1923), perhaps the greatest actress who ever lived, performed in Canada on thirty-two separate occasions, sometimes visiting the same city twice in one tour, with visits ranging in length from a single night to six days. Montreal audiences saw her nine times, Toronto six, but Quebec City saw her only once in 1905. This three-day visit Bouchard takes as the starting point for his play. Bernhardt brought a repertoire of three plays – La Dame aux Camélias (1852) by Alexandre Dumas, Angélo (1835) by Victor Hugo and Adrienne Lecouvreur (1849) by Eugène Scribe and Ernest Legouvé. The Archbishop forbids her to appear on stage in Quebec City and criticizes her choice of Scribe’s play because it “sings the praises of adulterous love” and “ridicules a man of the cloth portrayed as a plotting habitué of Parisian salons”. In reality this prohibition was delivered from church pulpits and in the newspapers. 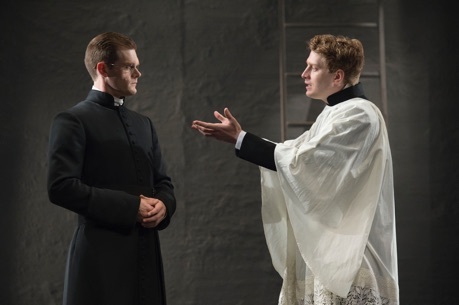 In Bouchard’s play, two young seminarians are chosen to deliver the Archbishop’s letter of condemnation personally to Bernhardt. With this the fiction begins, and it must be admitted that clichéd and melodramatic as it is, Bouchard’s fictional addition to history is far more interesting than his paltry account of the historical events themselves. The two seminarians enrolled at the Grand Seminary of Québec, are Michaud (Ben Sanders), son of the province’s Minister of Finance, and Talbot (Wade Bogert-O’Brien), son of a poor family. His 12-year-old brother Léo (Kyle Orzech) must work with his mother (Mary Haney) in a shoe factory to pay for Talbot’s schooling. Michaud is a theatre fan who knows more about plays than real life and is thrilled that “the divine Sarah” is coming to Quebec City. Talbot has no interest in the theatre or Bernhardt. He arrives at the seminary on his first day with a head wound he got in a fight, a fight as we discover, with the priest who had been abusing him for five years. Brother Casgrain (Martin Happer) decides that Michaud, in whom he has a more than fraternal interest, should deliver the Archbishop’s letter to Bernhardt and Michaud chooses Talbot to accompany him. Michaud delivers the letter, falls into conversation with Bernhardt, shows her some lines he has written for a realistic drama about the poor (based on Talbot’s life), and Bernhardt encourages Michaud to complete his play in three days promising that she will star in it as Talbot. Bernhardt later decides to visit the factory where Talbot’s mother works as research for the as-yet-unwritten play. Meanwhile, Brother Casgrain tells Talbot that if he lies about why he fought the priest then Casgrain will ensure that Talbot and his brother will have their education for free. Thus, all our interest in the action lies with what Talbot will do, not Bernhardt. The large number of improbabilities Bouchard requires to link the seminarian plot to the Bernhardt range from minor to major. We see that Bernhardt has a manager Meyer (Andrew Bunker), whose function should be keep the diva undisturbed by outsiders, especially by the press. Yet, somehow Michaud and Talbot are able to enter Bernhardt’s inner sanctum without difficulty. A woman’s natural response to finding two strange men in her boudoir would be to tell them to leave, or in Bernhardt’s case, have Meyer force them to leave. Yet, Bouchard would have no play if that occurred so has Bernhardt engage the two in conversation. He has Bernhardt think that maybe the two are actors there to audition for the role of priest in the play, but since she has mentioned that only minutes before to Meyer, no one in the city could know any such opening was available. Bouchard has Bernhardt praise Michaud’s lines about poverty by saying they are like Victor Hugo. Yet, she has to mean only certain of Hugo’s novels, since all of his plays are written in the romantic style, not the realist style that inspires Michaud. For Bouchard to have Bernhardt claim she will act in a realist play is ludicrous. One only has to look as the repertoire she brought to Quebec City to note that all three plays are mid-19th-century romantic dramas. In Adrienne Lecouvreur, the only play Bouchard mentions, the title character dies from smelling poisoned violets, hardly an accoutrement of realist drama. In fact, Bernhardt’s repertoire consisted of exactly the kind of overblown romantic nonsense that playwrights like Ibsen, Strindberg, Shaw and Chekhov were reacting against. Bouchard does mention that Shaw ad Chekhov disliked Bernhardt’s acting style. Shaw describing her acting as "childishly egotistical" and remarked that ‘she does not enter into the leading character: she substitutes herself for it” since her acting contrived to thrill rather to be realistic. Since Bernhardt, like many modern movie stars, was thus always playing herself, it is equally ridiculous to think she would ever research a role, especially one not yet written, by visiting so lowly a place as a shoe factory. Yet, as in his other plays, Bouchard’s contrived plot depends on such illogicalities. At the factory, Bernhardt discovers that the manager Mr. Willis (Ric Reid), who is a watered-down old-fashioned villain from melodrama like Simon Legree, has been employing child labour. Not only does Willis try to hide that general fact but the specific fact that the niece of one of his workers has been decapitated by getting caught in the factory machinery. Bouchard has obviously not listened to Willis’s own earlier description of his factory. Willis employs 200 people because he has no machines, not even one to cut leather or put on soles, and he wishes he did have them since machines can’t go on strike. Well the, if all the shoes in Willis’s factory are made by hand, what non-existent machine was it that was so large that it could decapitate a child? As in The Madonna Painter (2003) and Tom at the Farm, Bouchard loves to use grotesque imagery, but has to bypass logic or consistency to obtain it. The result of Bouchard’s drama “for Sarah Bernhardt”, is that we learn nothing new about except that she travelled with a stuffed alligator since most of Bouchard’s depiction is is untrue to her character and interests. Bouchard is right that Bernhardt made two important speeches in Quebec City – one criticizing the people of Quebec and one praising the virtue of the theatre. In the first she remarks that since she first visited Canada only agriculture has progressed and that the country still “has no painters, writers, sculptors, poets …. You have progressed in 25 years but … backwards.” As the reason for this she notes, “Ah, yes, I understand, here you are still under the yoke of the clergy”. Bouchard has Michaud praise Bernhardt, saying, “You are the woman who dares to say everything that should be left unsaid”. But what was the result of this incident in 1905. It was not the furthering of free speech. Instead, it led to the establishment of an official provincial censor. Yet, even the topic of ecclesiastic censorship in Quebec is nothing new. It had continued from the Church’s objection to Molière’s Tartuffe in 1694 into the 1950s. Bouchard’s treatment of sexual abuse by the clergy may seem timely but is also nothing new. Bouchard treated the same topic in his play Lilies (Les feluettes) in 1987. In many way, The Divine gives the impression that Bouchard has simply grafted Lilies onto a potted history of Bernhardt. As a final weakness, we have to point to the ending. Mrs. Talbot’s younger son Léo has just died in the factory and she comes to visit Talbot in the seminary. Naturally, we assume that Léo’s death will be the subject of her conversation. Instead, Mrs. Talbot is furious with Talbot for something that happened the night before. She heard his laughter coming from the opium den near their house. For that she wants to disown Talbot. His mother’s anger somehow causes Talbot to agree to Casgrain’s bargain that he lie about why he fought the priest. Clearly, this is the ending Bouchard wants and he doesn’t mind violating logic to get there. How such a fundamentally flawed play could be deemed ready for performance much less praised in major newspapers is a puzzlement. 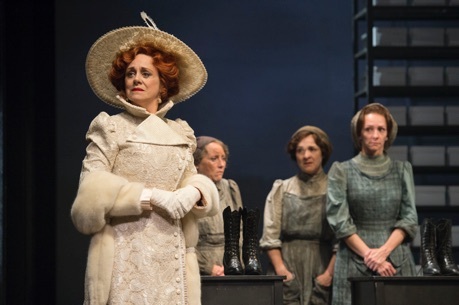 What is true is that the play, despite its tedious passages, is watchable primarily because the acting ensemble under director Jackie Maxwell is so strong. Since Bouchard has done nothing to make Bernhardt more than just a generic grande dame of the theatre, Fiona Reid gives us her attractive but still generic grande dame of the theatre who resembles most a more calculating version of her Judith Bliss, the matriarch and former actor in Noel Coward’s Hay Fever (seen at the Shaw in 2002). Ben Sanders’ Michaud is such a fantasist in the first part of the play writing everything down in his diary he seems like a male version of Cecily in The Importance of Being Earnest who is meant to be taken just as seriously. Michaud’s encounter with Bernhardt is so unlikely, moving as he does from extreme shyness to actually telling Bernhardt how read lines, Sanders can only play it with a kind of giddy enthusiasm. Sanders’ character doesn’t come across as real until Bouchard gives him a 180º turn when he sees the shoe factory and learns of Talbot’s abuse. Bouchard and Sanders oddly allow it to remain ambiguous whether or not Michaud is attracted to Casgrain and to Talbot. Wade Bogert-O’Brien lends Talbot a sullenness of thwarted anger that makes his character the more intense figure on stage. He doesn’t change from this mood until, chillingly, he finally tell the real story of why he fought with the priest and the personal horror that led up to that moment. Martin Happer gives a very subtle performance of Brother Casgrain, his measured, restrained tone of voice gradually slipping into ardour when he speaks with Michaud or threats when he speaks with Talbot. Mary Haney’s Mrs. Talbot is most believable in the first act when she shows the poor woman’s awe at the grandeur of the dormitory of the seminary and pride at the heights she thinks her son has achieved. Though she throws all her fire into it, Haney can do nothing to make the wrath Bouchard has manufactured for Mrs. Talbot make any sense. In other parts Ric Reid tries to downplay the melodrama inherent in his role as the unscrupulous shoe factory owner Mr. Willis, but it still rises to the surface when Willis refuses to allow a worker to retrieve her niece’s head. Kyle Orzech is a breath of fresh air as Talbot’s joke-telling brother Léo. Andrew Bunker finds the comedy in Bernhardt’s harried manager Meyer, a man accustomed to her whims. And Catherine McGregor is a strong presence as Emma, a worker at the shoe factory who lashes out at Willis’s injustices. Compared with modern plays like Caryl Churchill’s Top Girls (1982) and Tony Kushner The Intelligent Homosexual’s Guide … (2009), both playing at the Festival, Bouchard’s The Divine neither breaks new dramaturgical ground, digs deeply into his subject nor intellectually challenges the viewer. Indeed, he is quite content to cobble together stereotypes and old truisms without ever digging into the essence of his dual topics of Bernhardt and ecclesiastical censorship. Bouchard’s play gives the impression that Bernhardt’s treatment in Quebec City was typical of her treatment in the province of Quebec in general. That is not true. In his paper “Sarah Bernhardt and the Bishops of Montreal and Quebec” (1986)*, which anyone interested in the real story should read, Ramon Hathorn notes that the Bishops of both cities forbade parishioners from attending Bernhardt’s performances, but only in Quebec City did they feel obliged to obey. As he concludes, “Today we might consider such controversy merely a tempest in a teapot, but for the 1905 incident. Marred by anti-semitic undercurrents which were not repudiated publicly by the clergy of Quebec City, it leaves one with a sense of unease and regret and suggests a facet of Quebec intellectual and ecclesiastical history that deserves serious exploration by scholars”. These undercurrents also deserve more serious exploration from Bouchard, who, rather than serving up a reheated version of Lilies, ought to have asked why Bernhardt’s treatment in Quebec City was so unlike that in Montreal, which she would visit four more times after 1905. *Ramon Hathorn, “Sarah Bernhardt and the Bishops of Montreal and Quebec”, CCHA, Historical Studies, 53 (1986), 97-120: www.cchahistory.ca/journal/CCHA1986/Hathorn.pdf. 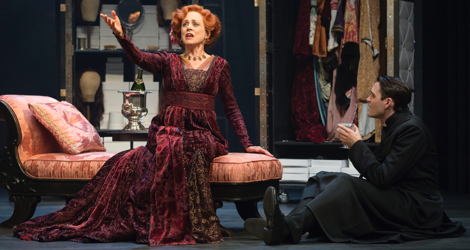 Photos: (from top) Fiona Reid as Sarah Bernhardt and Ben Sanders as Michaud; Martin Happer as Casgrain and Wade Bogert-O’Brien as Talbot; Fiona Reid, Mary Haney,Jenny L. Wright and Catherine McGregor. ©2015 David Cooper.